By the time we’re done with this tutorial you’ll have a Hadoop cluster consisting of one master node and two slaves. The slaves are formatted with HDFS and process MapReduce jobs that are delegated to them from the master. The whole cluster is monitored by Ganglia. The nodes are very interdependent. By that I mean that each node needs to have 2 or 3 configuration files that are based on the other currently running nodes in the cluster. As nodes are joining and leaving the cluster each of these files on every node needs to be updated. PoolParty handles this process for you more-or-less automatically. The benefit is that you don’t have roll your own methods to do this every time you want to setup a cluster. In PoolParty plugins are first-class citizens. This means you can write your own plugins and they are every bit as powerful as the resources that make up PoolParty core itself. This makes it easy to break up server functionality into modules of code . PoolParty, in a sense, gives you object-oriented server configurations. You can, for instance, take a Ganglia object, call a few methods and PoolParty takes care of executing the required commands to deploy a configured Ganglia cluster. PoolParty is built around the notion of pools and clouds . A pool is simply a collection of clouds. A cloud is a homogeneous set of nodes. i.e. every node in a cloud is configured the same way . Obviously nodes in a cloud will have different sets of working data as they run, but the idea is any node in a cloud could be substituted for any other node in that same cloud. PoolParty itself is designed to be fully distributed and masterless. There is no required concept of “master” and “slave” in PoolParty itself. That said, many pieces of software, such as Hadoop, do have this concept and PoolParty can be configured to take advantage of that. We’ll be setting up our pool as two clouds hadoop_master and hadoop_slave. Obviously, hadoop_slave will be a cloud (cluster) of nodes configured to be Hadoop slaves. hadoop_master will also be a cloud of masters. In our example we’re only going to use 1 node as the master. But you could relatively easily configure everything to have more than one master. You have the proper EC2 environment variables setup. 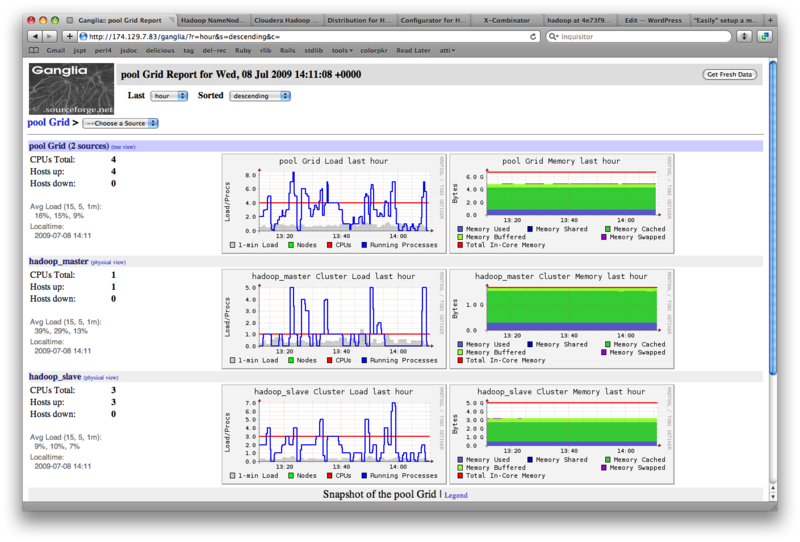 See Setting up EC2 on the PoolParty website. For instance, a typical PoolParty install would have these variables in $HOME/.ec2/keys_and_secrets.sh. You have PoolParty installed from source. In theory, you should be able to install the gem. However, today you should probably install from source. Make sure you have git://github.com/auser/poolparty.git checked out and then follow the “Installing” directions on the PoolParty wiki. You only need to complete the two sections Dependencies required to build gem locally and Instructions . This will install all the development dependency gems and then make sure you have all of the submodules. NOTE PoolParty deploys ruby gem versions based on the versions on your local machine. So make sure you have the most recent versions of the required gems installed locally. Every cloud in PoolParty must have its own unique keypair. Thats important enough it’s worth repeating: every cloud in PoolParty must have its own unique keypair . You’ll also want to create a security group for our pool . ec2-add-group hadoop_pool -d "the pool of hadoop masters and slaves"
NOTICE: Hadoop has a crazy number of ports that it requires. The ports below will work but may not be the most secure configuration. If you understand this better than I please recommend better settings. Otherwise proceed knowing that these ports are probably a little too open. NOTE : There are a number of configurations that rely on the whole cloud being booted. This means that the first time you run cloud-start you may see a few shell errors. This is okay as long as it goes away after subsequent configures. The idea is that all nodes need to be started before the whole configuration will work properly. Tons of information will fly by. Be patient, this could take upwards of 15 minutes. Everything done? Good. Now you’re going to need to configure a second time. Now that all the nodes are booted they can be configured to talk to each other properly. Again, tons of output should fly by. Wait for it to finish. Uncomment the run_example_job line and configure, but this time we only need to configure master. This should work, but there is a chance the hdfs wont be started in time to load the sample job. If that happens, just configure one more time. Congradulations! You now have a scalable Hadoop cluster at your disposal! Checkout the PoolParty IRC channel, we’re always around and ready to help #poolpartyrb. This entry was posted in cloud-computing and tagged hadoop, poolparty. Bookmark the permalink. Post a comment or leave a trackback: Trackback URL.